Stems: Erect, simple or sometimes sparingly branched above, mostly glabrous but upper portion glandular-pubescent. Leaves: Opposite, entire; stalks 1/5 to 2+ inches long, densely fringed with hairs; stem leaves egg-shaped to lanceolate, 1.5 to 6 inches long, .7 to 2.3 inches wide, upper surface dark to bright green, lower surface paler; base rounded or somewhat heart-shaped; tip pointed to long-tapering pointed. Inflorescences: Solitary flowers in upper leaf axils; stalks .6 to 3 inches long, somewhat nodding. Flowers: Calyx green, deeply parted, tube short, lobes lanceolate, entire, 1/12 to 1/3 inch long, 3-6 parallel reddish-brown veins; corolla wheel-shaped, yellow, 5-lobed; lobes egg-shaped to round, 1/5 to 1/2 inch long, margin erose, tip with delicate awl-shaped point, base sometimes red blotched; stamens 5, distinct. Fruits: Capsule, nearly spherical to egg-shaped, 1/12 to 1/3 inch in diameter, glabrous; seeds 25-40, 3-angled, reddish-brown. Habitat: Wet meadows, marshes, borders of streams and ponds, moist woods and thickets; wet or moist low ground; shade or sun. Comments: In Greek, Lysimachos was a compound word lysis "loosing" or "releasing" and mache "battle" or "strife", which gives us the name "loosestrife". 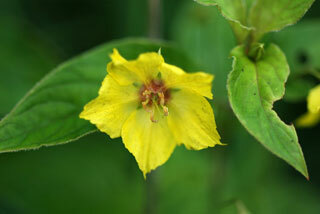 Legend relates that an ancient Greek king calmed an enraged bull by waving a loosestrife plant. Latin ciliatus "fringe of hairs like eyelashes" is from Latin cilium "eyelid".